Location: Kathmandu with frequent travel to project area. 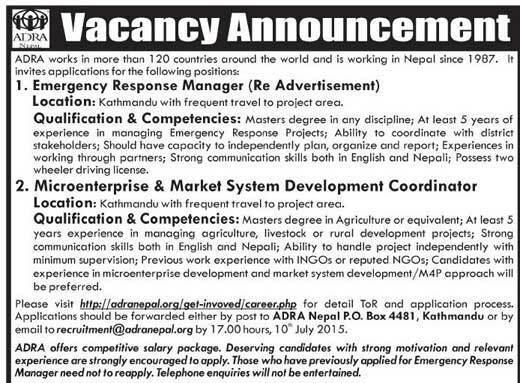 Qualification & Competencies: Masters degree in any discipline; At least 5 years of experience in managing Emergency Response Projects; Ability to coordinate with district stakeholders; Should have capacity to independently plan, organize and report; Experiences in working through partners; Strong communication skills both in English and Nepali; Possess two wheeler driving license. 2. Qualification & Competencies: Masters degree in Agriculture or equivalent; At least 5 years experience in managing agriculture, livestock or rural development projects; Strong communication skills both in English and Nepali; Ability to handle project independently with minimum supervision; Previous work experience with INGOs or reputed NGOs; Candidates with experience in microenterprise development and market system development/M4P approach will be preferred.